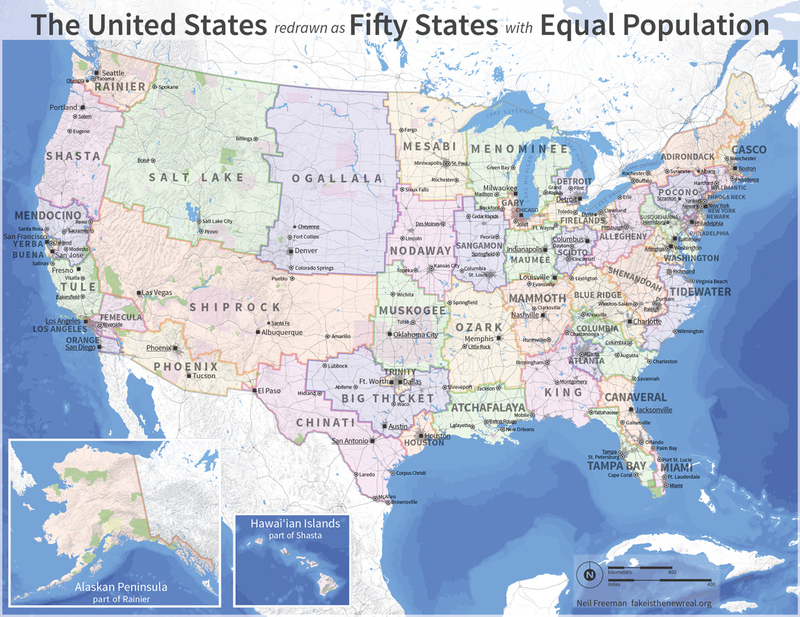 In an unearnest attempt to rethink the electoral college, Neil Freeman redrew the US into 50 new states with equal population. In an effort to reduce the disparity in size and influence of individual states in the current electoral college, Neil Freeman redefined geographical boundaries of all 50 states (and renamed them) so that they each contain a population of about of about 6,175,000. For example California is split into nine states while Colorado gets divided among Shiprock, Ogallala, and Salt Lake. The map began with an algorithm that groups counties based on proximity, urban area, and commuting patterns. The algorithm was seeded with the fifty largest cities. After that, manual changes took into account compact shapes, equal populations, metro areas divided by state lines, and drainage basins. In certain areas, divisions are based on census tract lines. Keep in mind that this is an art project, not a serious proposal, so take it easy with the emails about the sacred soil of Texas.